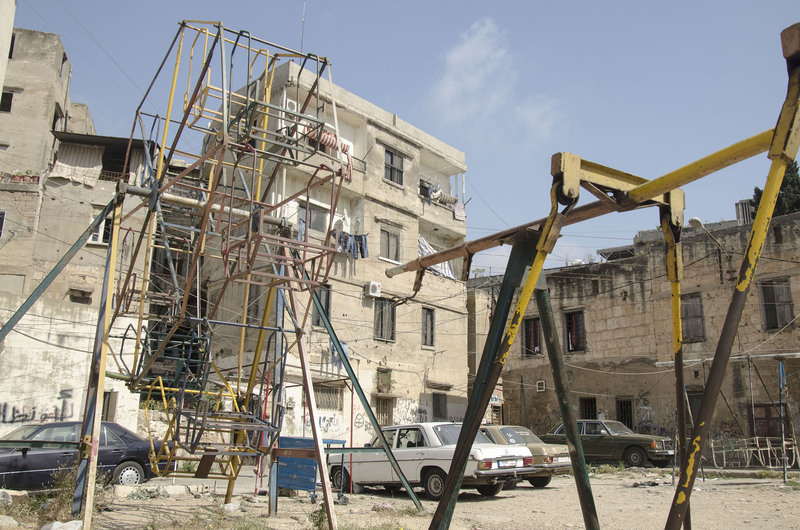 In the past years Tripoli, like many other urban contexts in Lebanon, has experienced a large influx of refugees from Syria, which further stresses an already-fragile social stability in the area. 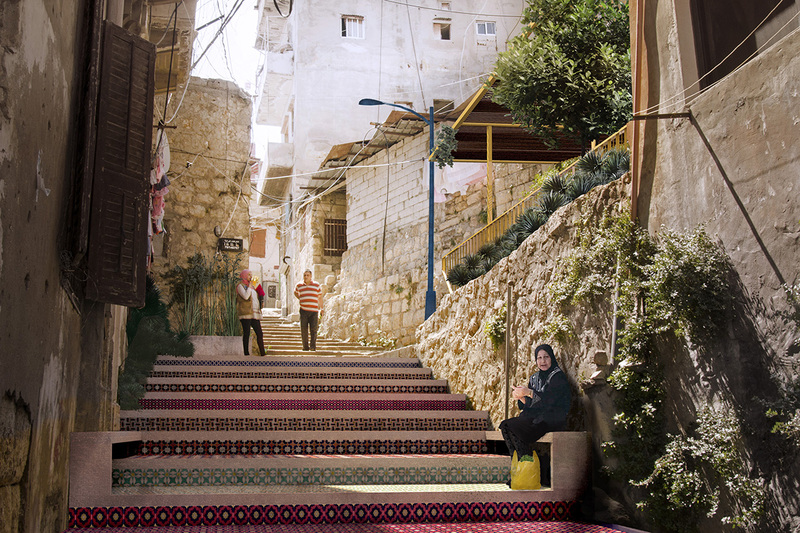 “If, as architects, we want to assist refugees and displaced people, we need to start a conversation with the host population so effective projects benefit both parties” says Andrea Panizzo, co-founder of Emergent Vernacular Architecture, a design studio, which is looking at providing design solutions for inclusive public space in Qobbe. 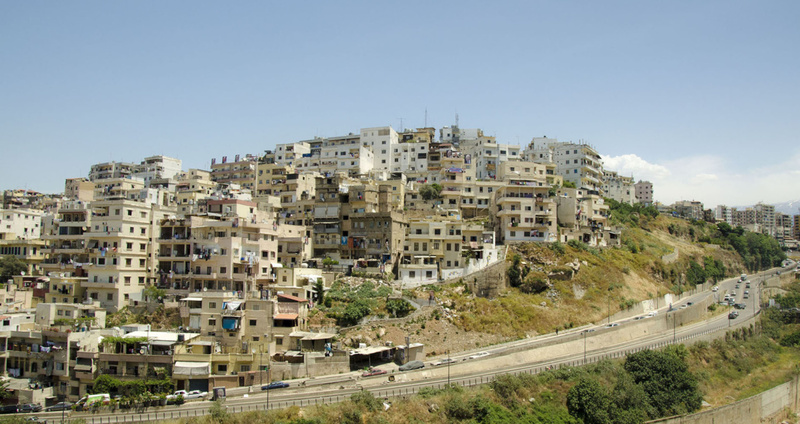 The journey to Qobbe, a neighborhood in Lebanon’s second largest city – Tripoli, leads through what was once the frontline of sectarian fighting. The road is lined with mid-rise apartment blocks each with their own tangle of cables, satellite dishes, clothes, carpets, and election posters hanging from the side. On street level a haphazard scattering of kebab shops, mini bazaars and hardware stores indicate commercial activity, but few people mingle outside. As the car slows to a stop at the first of several army checkpoints, less comfortable details emerge from the chaos. Bullet-holes adorn the walls on either side. “This is Syria Street”, Fatima, a fellow architect from Catalytic Action, announces from the back seat. 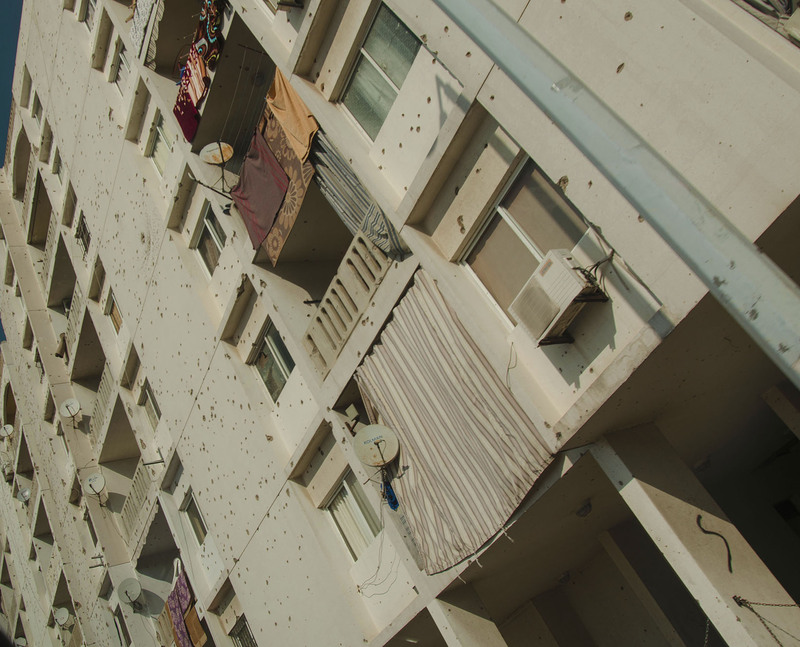 The punctured facades are a gloomy reminder of the violent clashes between the Sunni and Alawite militia from of Bab Al-Tabbaneh and Jabal Mohsen who occupy opposite sides of the street. These sectarian divides are one of the factors that drove the Lebanese Civil War, and resurfaced in 2011 – inflamed by the influx of Syrian refugees. Peace has held since 2015, perhaps helped by the work of nongovernmental organizations (NGOs) like Solidarités International and MARCH, which have been leading several social stabilization initiatives. Public spaces lie abandoned. Whilst the reason for their dismissal during the clashes seems obvious, it is harder to understand why they have not been used since the fighting stopped. Are the reasons related to the lack of security and public investment? The reason our design studio Emergent Vernacular Architecture is here is to understand what dynamics can be triggered in this vulnerable community through the reactivation of dismissed public space. built environment, such as crumbled facades and balconies, broken street lights and degraded drainage systems, which lead to continuous flooding in the winter. In addition, 43 percent of the Qobbe’s houses need major repairs, including improvement of exterior building conditions. The fragrant smell of Za’atar Man’ouche, a Lebanese flatbread with herbs, coming from a nearby bakery hits us. The car stops in front of a staircase. At the bottom, there is a small plaza, and further along – another staircase. Both small spaces are the subject of this trip and a testing ground for an intervention model. If successful, this light and practical approach, which is based on Placemaking strategies, might be scaled up and adopted around the neighborhood’s network of stairs, alleyways, and plazas. 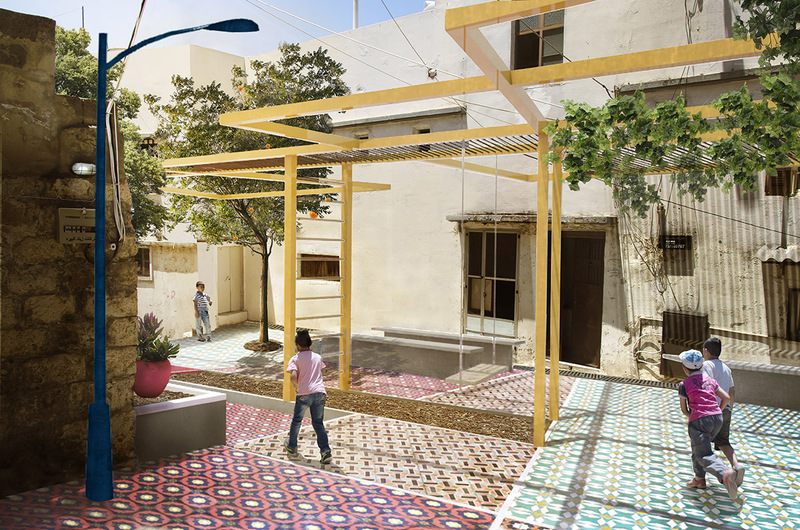 Before designing, we engage with the residents in a conversation about public space and observe the vernacular architecture – not only the local construction techniques, but also the way existing space is occupied and the daily cultural habits of local residents and inhabitant. Aside from the informal interviews, the talks are also organized by focus groups with both Lebanese and Syrian residents. These have been arranged with the help of our partner, Solidarités International, which has been working in the area since 2016. Design solutions and decisions should be addressed with a bottom-up approach. Social interaction encouraged by a neutral space – if such a concept can exist here – can only be achieved by bringing people of different backgrounds, ages, and gender together to the drawing table. Turkish coffee with cardamom is poured. The first focus group is with Syrian women living in the area. They describe their public life in Syria, from the daily shopping in souks to picnics with friends and family in small parks. Despite the nostalgia, they do not think they will go back anytime soon. For them, Qobbe is home now, even though some do not feel welcome in Tripoli. The public spaces are often the demarcation line between sectarian divides – and so they are places to be avoided. “We just want to have a place that helps getting rid of the guns from our children’s heads! “The Lebanese women have their turn now. They do not seem to mind the refugees, some of which they invite to sobhiyyeh, their morning chit-chats. They are insistent on reusing the existing public spaces and seem particularly focused on their children’s needs. As one remarks, her children were not allowed to leave the house long after the men outside put down their guns. Quality design is driven by its context, understanding it, and the impact a development has on it is crucial to the work of an architect- or at least it should be. A child climbs down from its mother’s lap and offers us a big bag with ripe loquats. Whilst the women seem open to the Syrians presence, the men are clearly more reluctant to the idea of using shared spaces. They relate the refugees to the Syrian Army occupation, which ended only in 2005 with the Cedar Revolution. After 29 years of military presence, mistrust still hangs in the air. The politics of a place need to be understood, as they can influence the success of any public project. The tension between the two populations and the outcome of these discussions, (part of an ongoing community engagement process led by Solidarités International) are useful indicators of what can be achieved in Qobbe. The mood at the meetings is extremely convivial. Despite their challenges, or perhaps because of them, members of the community want to have their voices heard and they appear to welcome these discussions. Encouraging opportunities for residents, including hiring local artists, artisans, and builders can help reduce the tensions. Working together on a project that benefits everyone may be a way of putting individual and cultural differences aside. Security can be improved by creating opportunities for collaboration and exchange through placemaking activities, such as public art workshops and murals. These help the residents take ownership of the place and to create better social integration for refugees living in a host community. 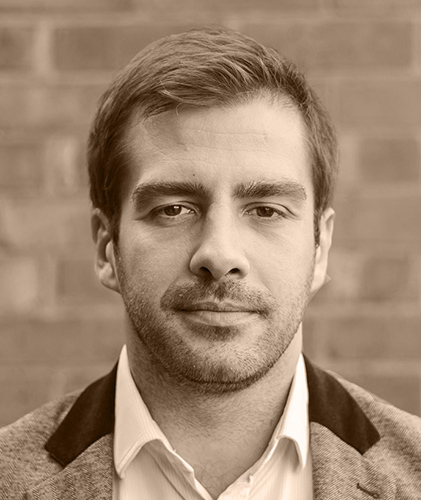 Developing a sense of ownership, and therefore local identity, is the intended outcome of these initiatives. It is a long process that begins with the thematic discussions described earlier, which are aimed at creating a consensus. As the global demographic shifts to a more urban society, more cities will face challenges similar to those faced by Tripoli. By 2050, the world’s population is expected to double, with 7 of 10 people living in urban areas. This dramatic growth must be sustainable. One of the ways of achieving this is by putting public space at the heart of a collective and more inclusive culture. 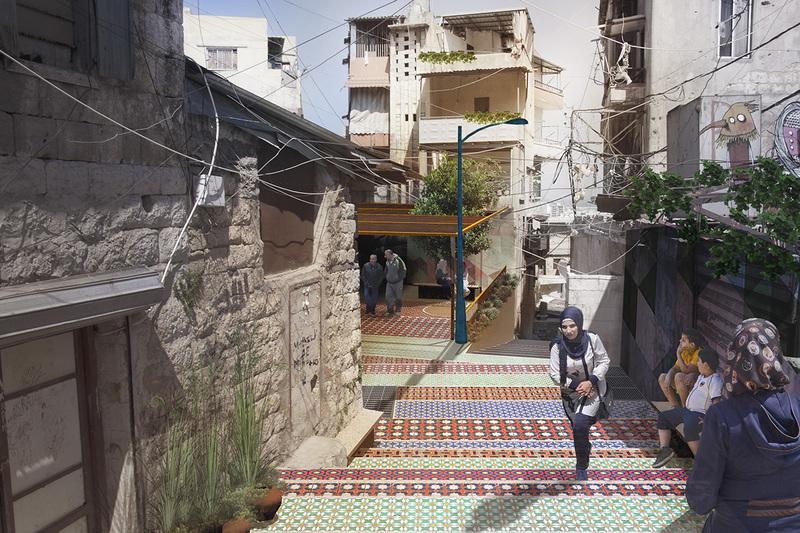 Investing in public space in places like Qobbe can also become one of the keys to integrating refugees with the host population, and reducing the risk of rising violence.